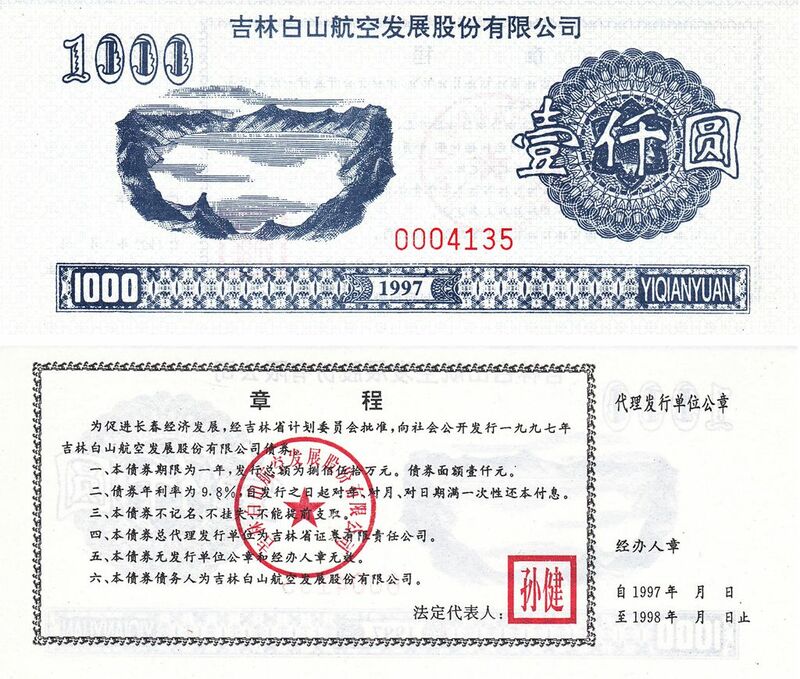 B8001, Hainan China-Beauty Co., Ltd, Bond of 1000 Yuan, 1995. XF condition, please refer the picture. Unused. Underwrite by (China) Hainan Province Trust Investment Company. The interest rate is 16.38% per year. 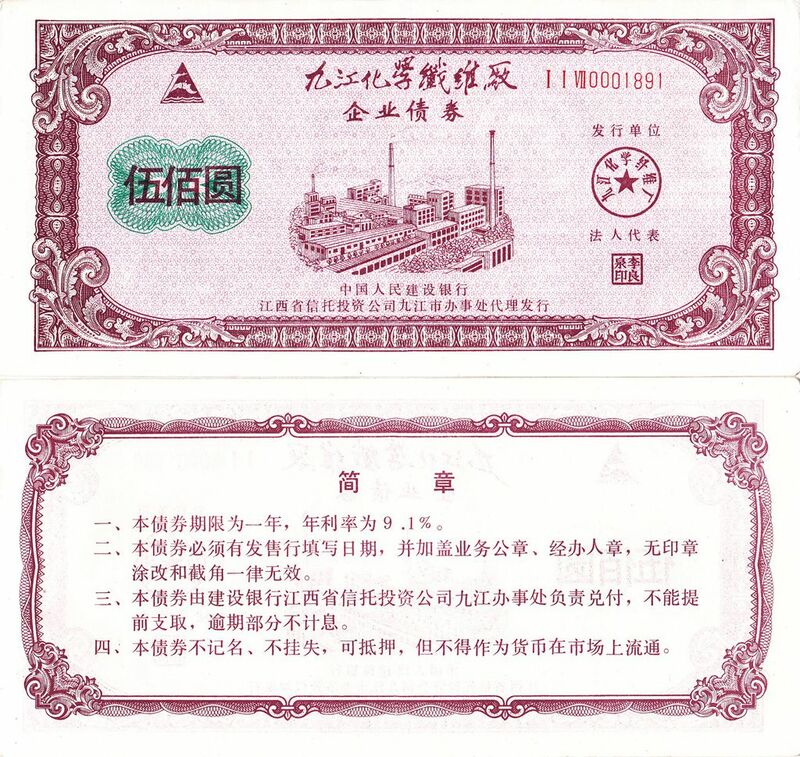 B8003, China Henan Xin-Ye Coal Co., Bond of 100 Yuan, 1991. Please refer to the picture, circulated and cashed. Issued in 1991 in Cnetral part of China. B8005, East Electronic Machinert Co., Bond of 100 Yuan, China 1988. Please refer to the picture, circulated and cashed. Issued in 1988 in Cnetral part of China. 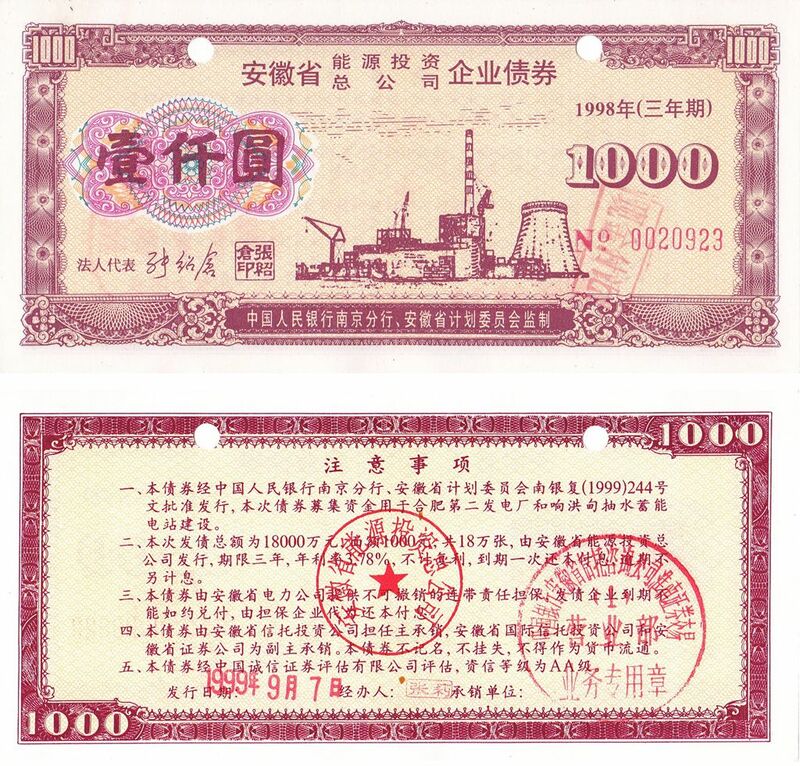 B8007, China Hainan International Investment Co., Bond of 1000 Yuan, 1991. Please refer to the picture, circulated and cashed. 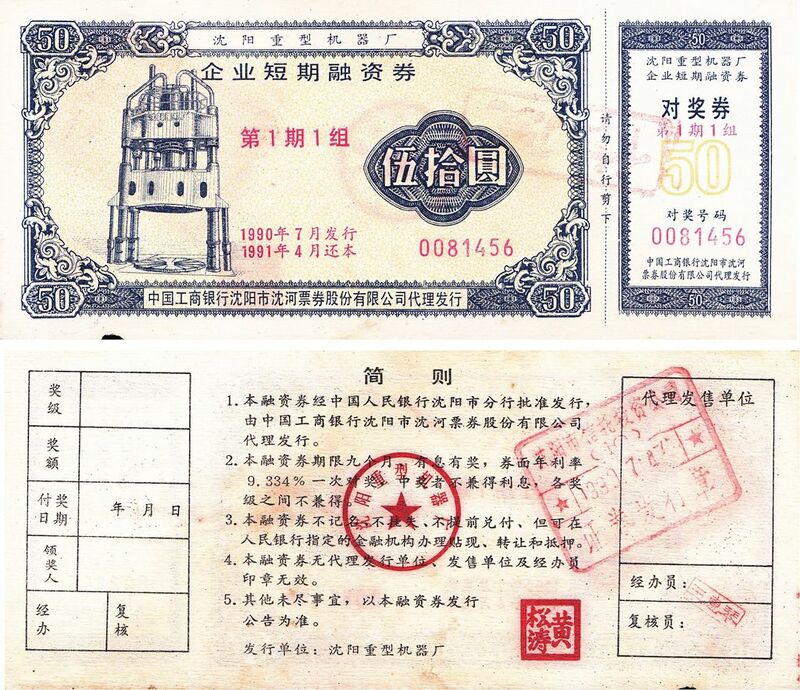 Issued in 1991 in Hainan Island. The face value is RMB 1000.00. With watermark. 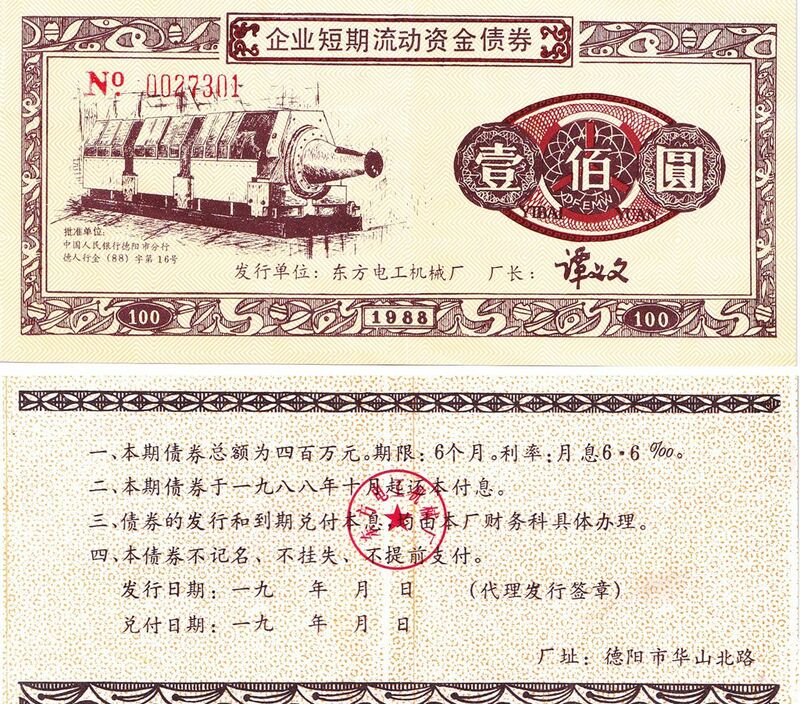 B8009, China Shenyang Heavy Machinery Co., Bond of 50 Yuan, 1990. Please refer to the picture, circulated and cashed. Issued in 1990 in China. The face value is RMB 50.00. 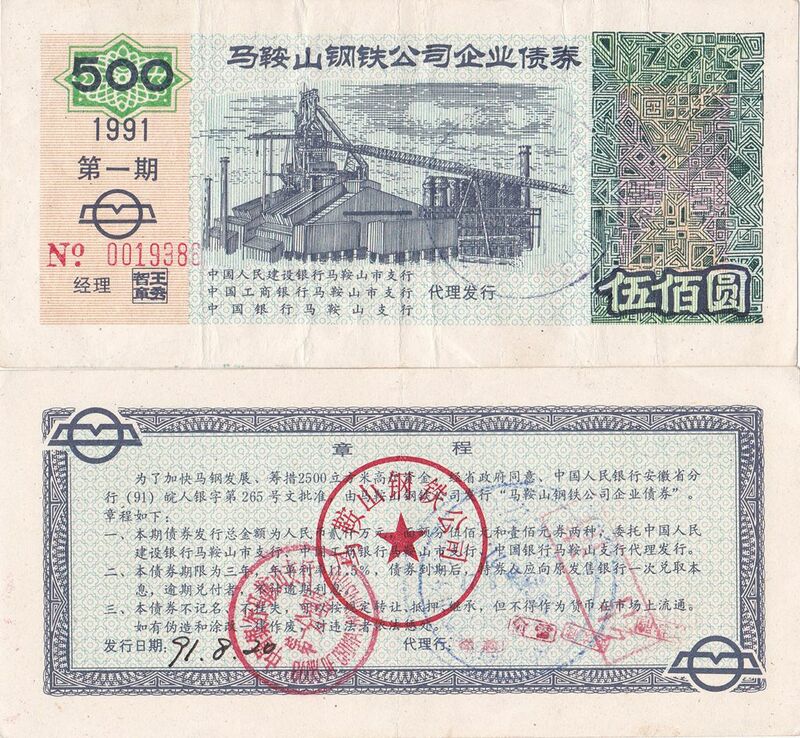 B8011, China Pingdingshan Coal Co., Bond of 50 Yuan, 1990. Please refer to the picture, circulated and cashed. Issued in 1990 in China. The face value is RMB 50.00. 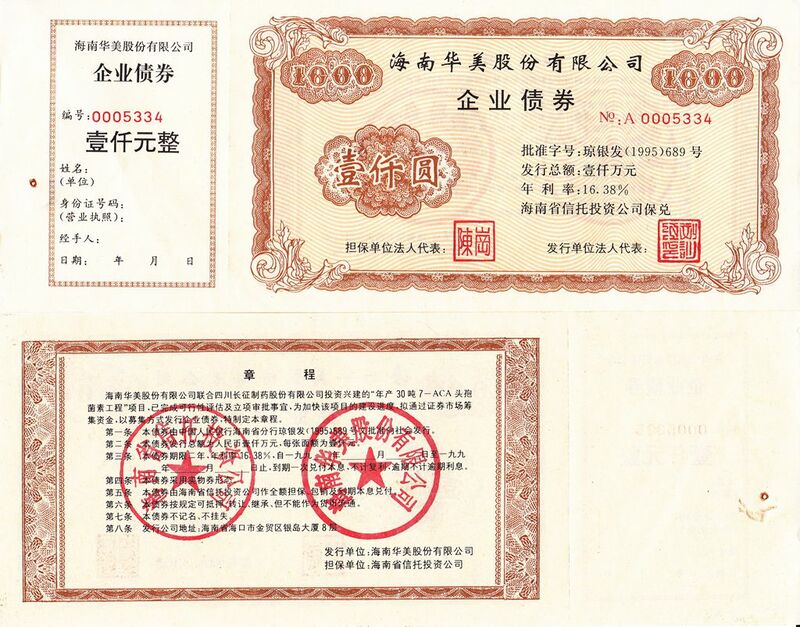 B8013, China Jilin Province White-Mount Aero Co., Bond of 1000 Yuan 1997. XF condition, with watermarks. Issued in 1997, by White-Mountain Aero Co. in Jilin Province of China. One-year duration with the interest of 9.8%. B8016, Maanshan Iron & Steel Co. Bond (Loan). 100 Yuan, China 1991. VF condition, cashed. 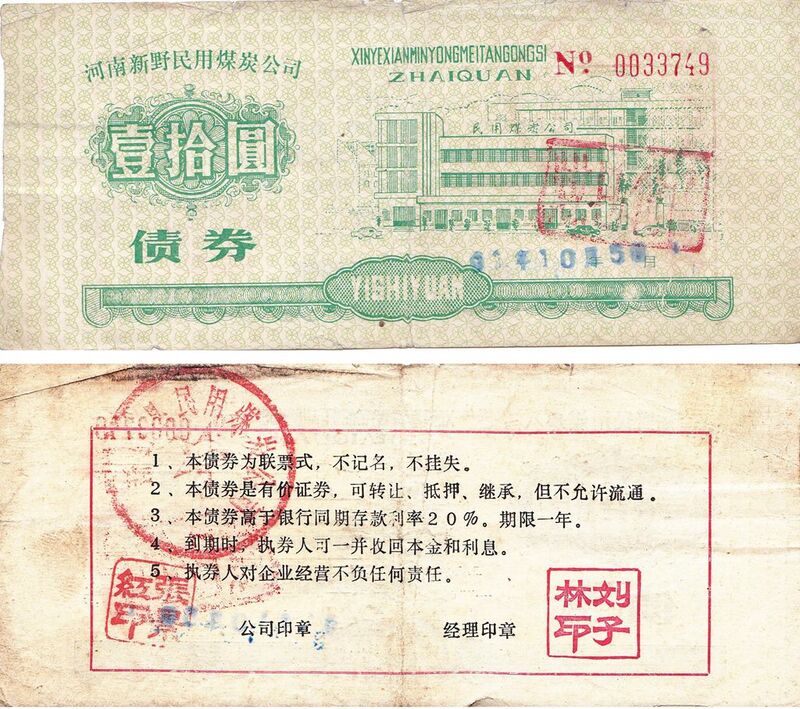 Issued by Maanshan Iron & Steel Co., Ltd. It is one of the largest steel company in China. Interest rate: 11.5% annum. Duration: 3 Years. B8017, Maanshan Iron & Steel Co. Bond (Loan). 500 Yuan, China 1991. VF condition, cashed. Issued by Maanshan Iron & Steel Co., Ltd. It is one of the largest steel company in China. Interest rate: 11.5% annum.Duration: 3 Years. 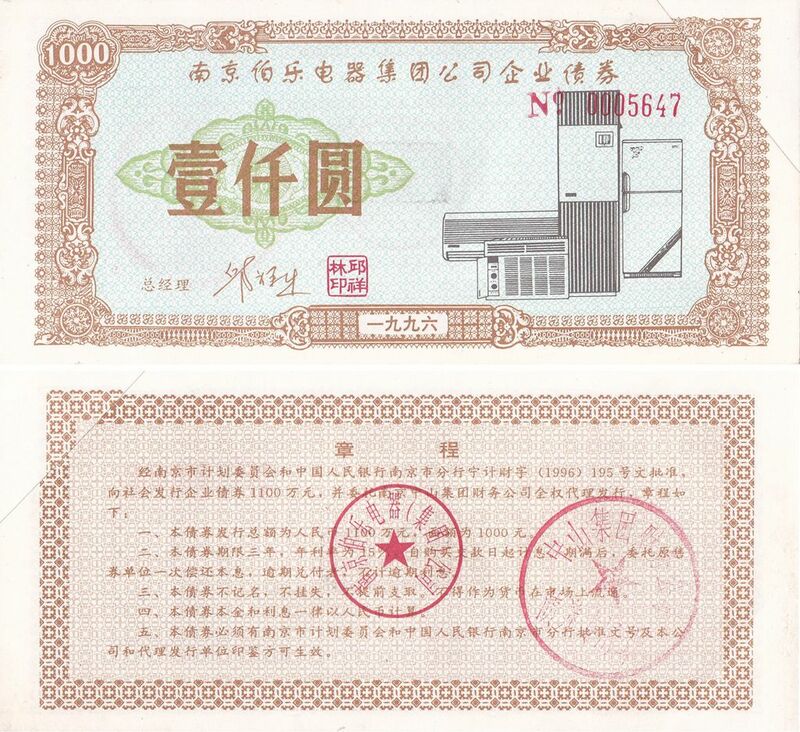 B8018, Bond of Nanjing Trust Investment Company, 1000 Yuan, 1993 China. VF condition, cashed bond. 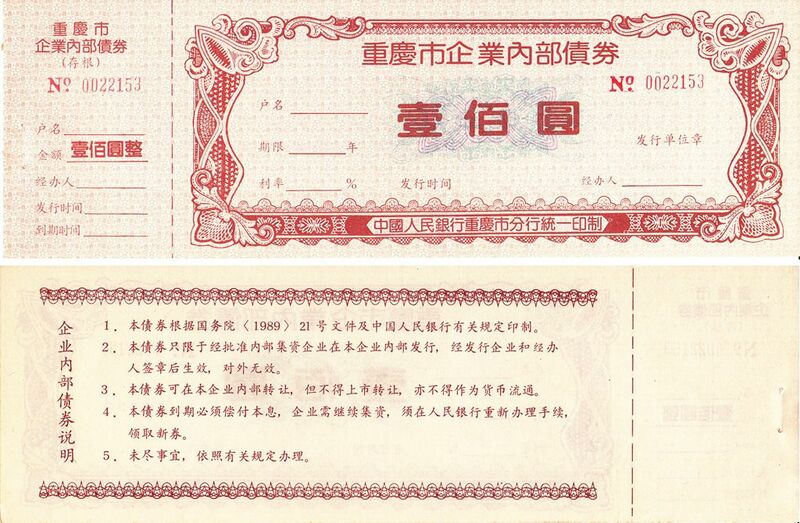 Issued in 1993 by (China) Nanjing Trust Investment Company. Face value: RMB 1000 Yuan.Interest: floted (2% plus the standard interest). B8020, Nanjing Bo-Le Group Co,. 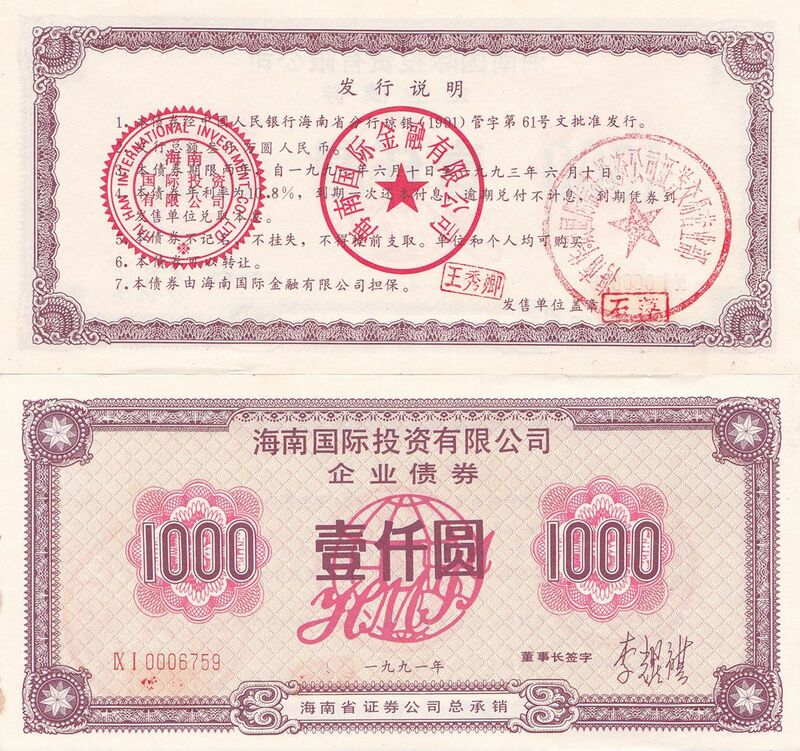 Bond of 1000 Yuan, China 1996. VF condition, cut edge for cancel. B8022, Panda Electronic Co, 2 pcs Bonds of 1994, China. VF condition. 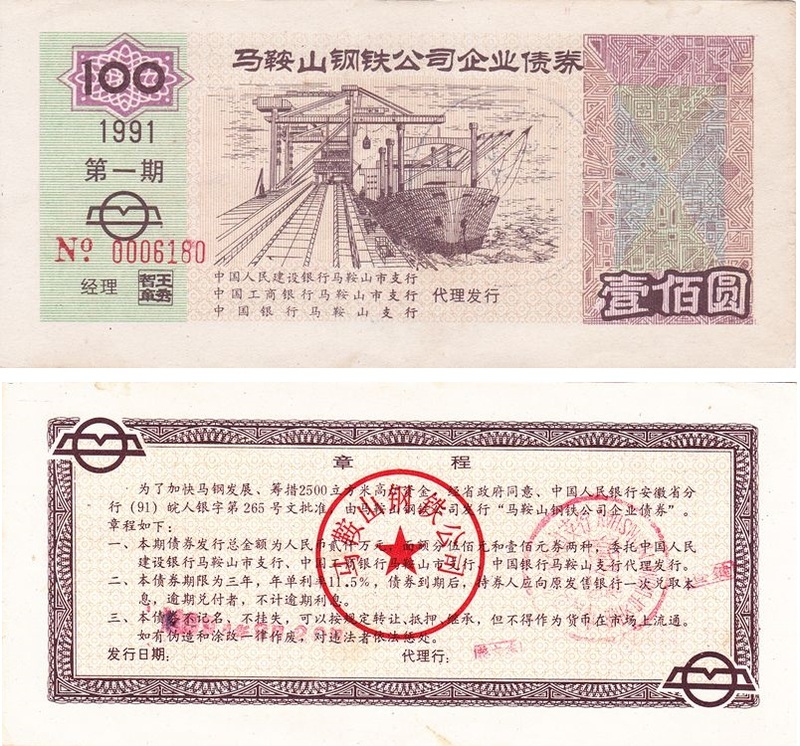 Issued in 1994 and 1995, the face value is both 1000 Yuan. 2 pcs in all. 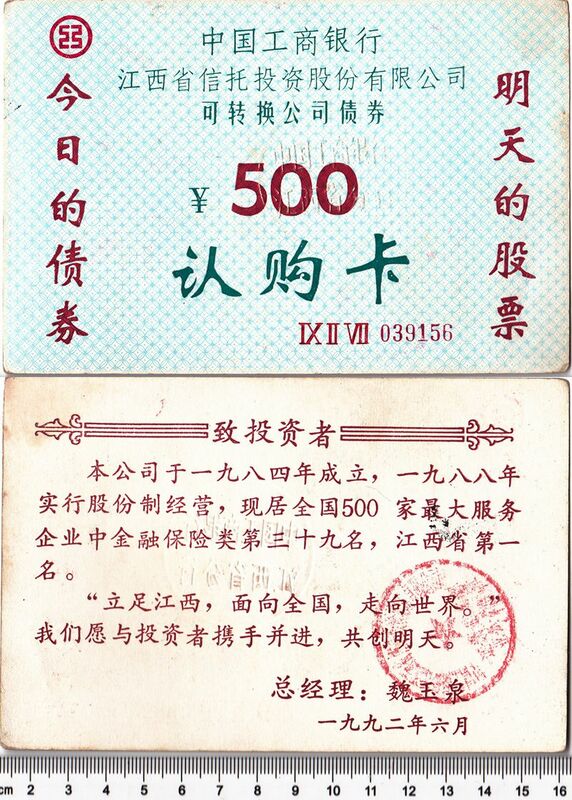 B8024, Jiujiang Chemical Co, Bond of 500 Yuan, China 1990. Vf condition, ununsed. 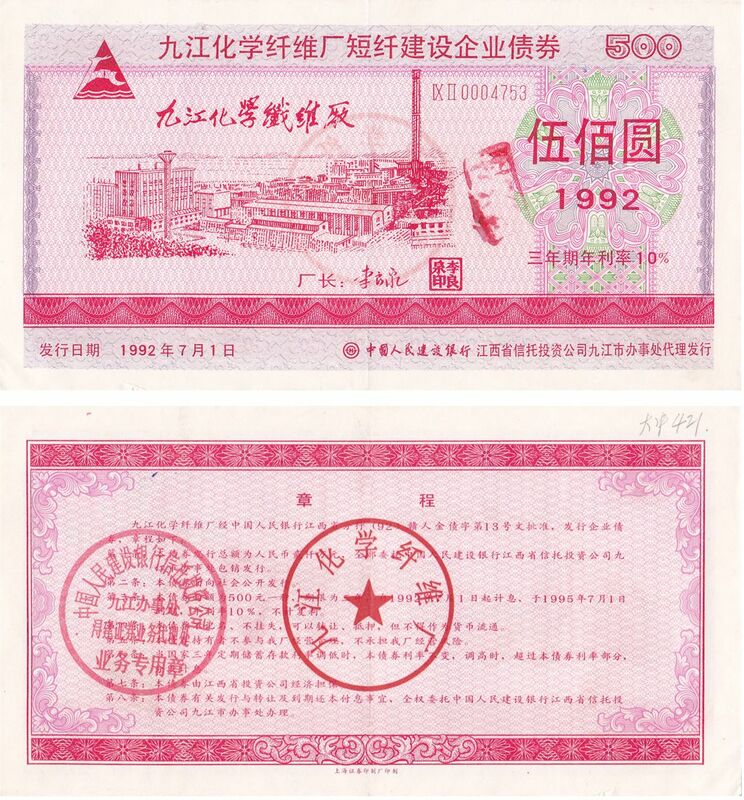 B8025, Jiujiang Chemical Co, 10% Bond, 3 Years, 500 Yuan, China 1992. VF condition, cashed. 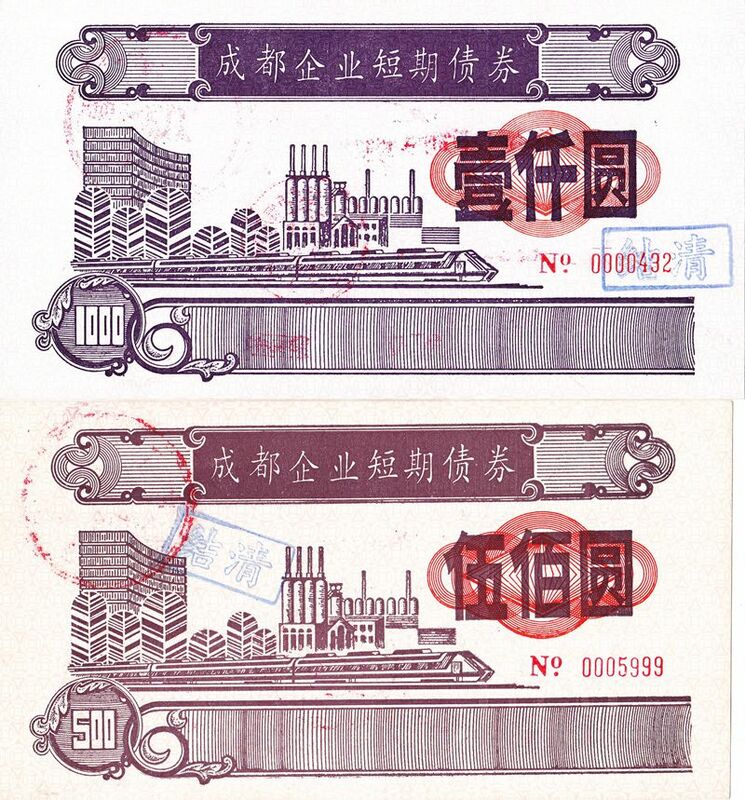 B8026, Anhui Province Power Co, Bond of 1000 Yuan, 1998 China. VF condition. Issued by (China) Anhui Province Power Investment Co., Ltd. The face value is 1000 Yuan. 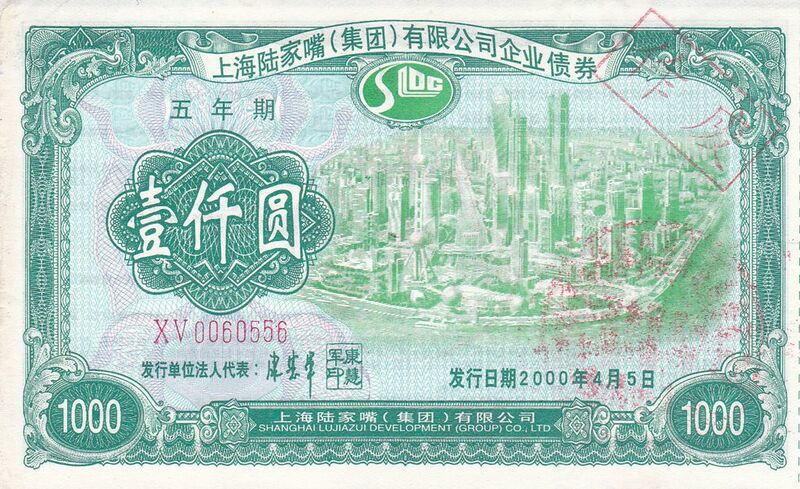 B8028, Chongqing City Corporate, Bond of 1000 Yuan, 1989 China. VF condition. Unused. The face value is 100 Yuan. 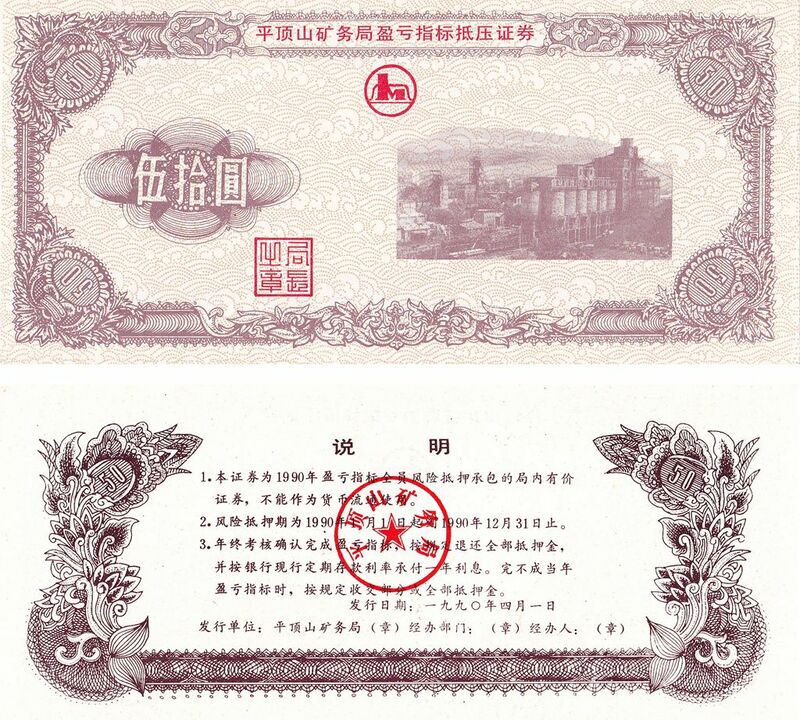 B8030, Jiangxi Trust Co., Convertible Bond of 500 Yuan, 1992 China. VF condition. cancelled. The face value is 500 Yuan. This is a kind of Convertible Bond, which can conerted to stocks after 3 years. 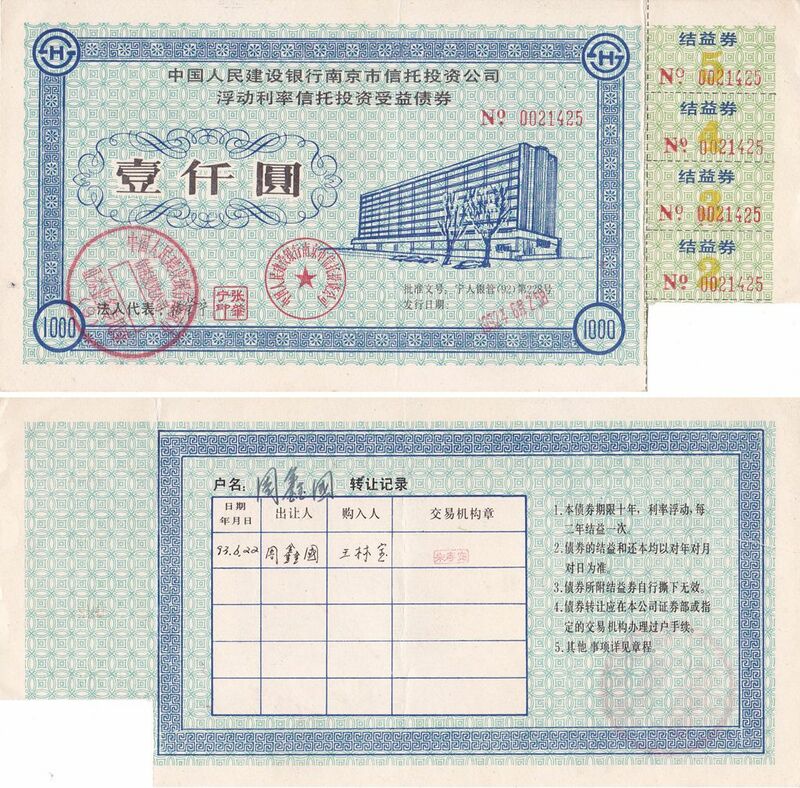 B8032, Chengdu City 11% Short-Term Bond, 2 Pcs, China 1990. VF, cashed. Face value: 500 Yuan and 1000 Yuan. Duration: 1 Year. Interest: 11% annum. Issued by Chengdu City of China.